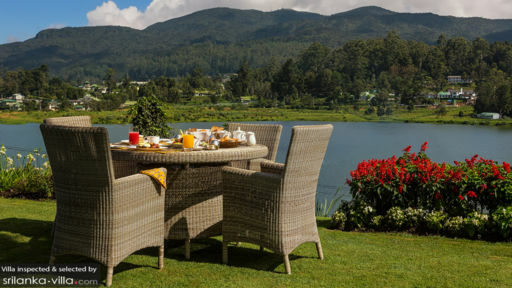 Hill Rise is found in Nuwara Eliya, a colonial hill station that is two-hours away from the city of Kandy, Sri Lanka. Unlike other parts of the country, this here has a cooler climate and the villa is located right on the side of Gregory Lake with stunning views of the lush hillside. Hill Rise is a colonial-style cottage with three, luxurious bedrooms, a living area with a fireplace, and lavish gardens that end where the lake begins. This serene, quiet corner of Sri Lanka is your own personal paradise for a the most rejuvenating holiday experience. The theme here is equestrian with stables, horses, and a chance to watch the magnificent animals in action or even ride one by learning from the best at Owners Stables. The four bedrooms at Hill Rise namely, La Dona Room, Natamala Room, The Governors Room, and The Queens Room are a trip back to colonial times with their antique furniture and fixtures. 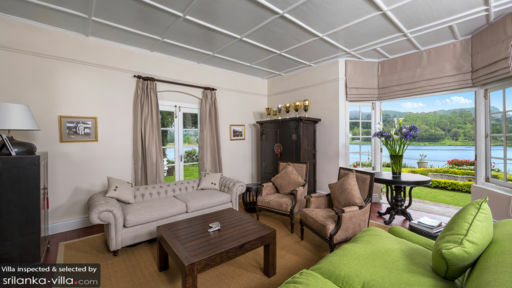 All the bedrooms are found on the same level as the lake and garden so you can enjoy spectacular views from the comforts of your private quarters. The bedrooms are furnished with genuine ebony four-poster or simple king beds with an option to add bunk beds in the master bedroom. The bedrooms even have a fireplace with a comfortable armchair or an ottoman as the perfect, cosy reading nook. The floors are carpeted so you can even be sung in front of the fireplace. Each bedroom comes with its own ensuite bathroom. The best part about staying at Hill Rise is the accessibility you have to the lake out front. From relishing a delicious breakfast by the water on rattan chairs to spending time doing yoga or meditation in the morning, the cottage serves each and every desire to rest and relax. There are blooming flowers, freshly-cut grass, tall years-old trees and a heady aroma of the fresh air to make you feel like your light years away from civilisation. There are tea estates beyond worth a visit to experience Ceylon tea in its rawest form. Designed in quintessential colonial style, the homely living area at Hill Rise is inviting and luxurious with its fireplace, natural green sofa, plush armchairs, and tufted daybed. The ceiling is flat to give you a more warm and cosy ambiance. Once the sun sets and temperatures drop, sit by the crackling fire with your loved ones, enjoy a glass of wine, and spend time in peaceful stupor. Leave the doors open to enjoy a wholesome view of Gregory lake even while you relax indoors. An opulent and almost-bejewelled dining area accompanies the living room with a large dining table that accommodates ten guests on red-upholstered chairs while jewel-tone curtains grace the windows. There is ample, luxe lighting in the room to illuminate each corner once the natural light diminishes. Guests can enjoy a delicious continental breakfast lakeside each morning prepared especially for you by the trained chef at Hill Rise. Hill Rise is managed by a team of generous and helpful staff members who are present to make your stay smooth and without any glitches. Apart from a delicious breakfast served fresh each morning, you have the option to hire the services of a private chef to prepare a lunch or dinner each day upon request, especially if you wish to try out local flavours. You are in for a visual treat once you reach Hill Rise; what with delicious views of the hills and the majestic Gregory Lake. Nuwara Eliya is known for its horses and tea estates and that is what you can do here. 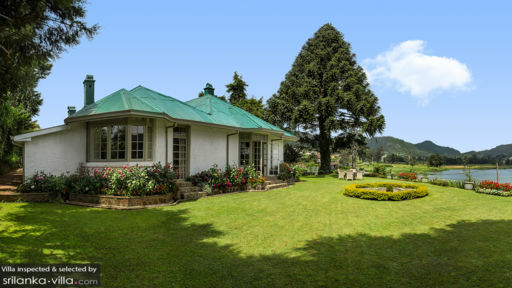 Head to Owners Stables or the Nuwara Eliya Golf Club for a relaxed day.